Because Charlotte is buzzing with so many things to do, there is a strong need for a workforce that provides excellent customer service to those who call Charlotte home as well as those who are coming to visit. The hospitality industry has grown significantly over the years and there is a demand for workers who are seeking to enter the field at just about all educational levels. Browse our career ladder to learn about a variety of jobs from human resource assistants to chefs to customer service representatives. Download the Occupation Spotlight documents to learn more about these in-demand positions. 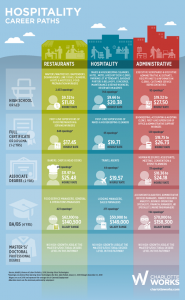 Our Career Ladder outlines each career path available in the Hospitality industry for every level of education. Download the career ladder to discover where your career in Hospitality can start today!